BIAFRA: HOW FAR CAN THE NIGERIAN GOVERNMENT RUN AWAY FROM ECOWAS? Wednesday 5th October 2016, Nigeria’s defence lawyer, embarrassed himself by absenting from the ECOWAS Community Court of Justice, in the case between the Nigerian government and Nnamdi Kanu, the leader of the Indigenous People Of Biafra, IPOB. Nigeria’s defense lawyer dodged ECOWAS Community Court because he is much aware that Nigeria has no case against Nnamdi Kanu, hence the unending trail. Muhammad Buhari, the president of Nigeria might have learnt his lessons very late, but he has just realized that his dictatorship ends within the boundaries of the Nigerian domestic courts and extending it to the Community Court has proved to be an impossible mission. The likes of Justice John Tsoho (the judge that presided and prolonged Nnamdi Kanu’s case at Buhari’s wish from 25th January 2016 till 26th September 2016) has no place at the Community Court else he rots in jail. 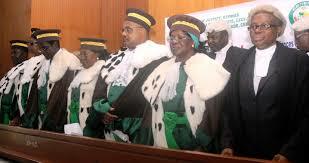 ECOWAS Court indeed has become the last resort for justice in Nigeria owing to Nigeria’s corrupt judiciary. With over one month of notice, this court case for 5th October 2016 has been scheduled and date communicated to the parties. It is unthinkable then, to learn that Nigeria’s defence counsel avoided today’s court for a court case in Kaduna State; and worse still, he submitted this motion in less than 3 hours to the court proceedings. Looking at this excuse, the question is; why did he not communicate this development weeks or even days before the court date? Is there no other competent lawyer in his team to stand in for him? Is Nigeria really ready for Nnamdi Kanu’s trail? Is there even any crime at all against Nnamdi Kanu? …the questions can go on and on. This, on the other hand, is an added dent to the already battered image of the Nigerian judiciary; it goes a long way to describe the conduct of Nigerian lawyers and the extent they uphold the rule of law. The conduct has drawn a clear picture of the state of the Nigerian judiciary. Biafrans across the globe is satisfied with ECOWAS’ approach to Nnamdi Kanu’s case today and further entreat that more strict measures be taken against the Nigerian judiciary to ensure that the whole essence of the judiciary is not defeated. We are hopeful that 8th November 2016 will bring an end to Nnamdi Kanu’s unjust prosecution and illegal detention. Read Also- BIAFRA: THE NIGERIAN GOVERNMENT GOES HIDING AS ECOWAS PROMISES TO GIVE FINAL VERDICT ON 8TH NOVEMBER 2016. The presiding Judge, Justice Micah Wright, was explicit when he stressed that the court must hear and give her final verdict on 8th November 2016. Nigeria might have dodged today but in the next court session, her whereabouts will not be a factor to be considered in giving the final judgment. Nnamdi Kanu is winning this case. That is a statement of fact.